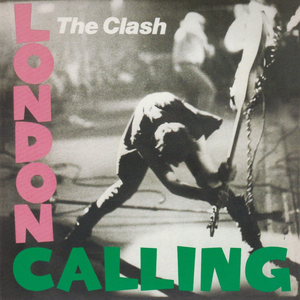 What better way is there to spend a Sunday afternoon alone than to play London Calling (or as it is known in the north, That London Calling) very loud while throwing Strummeresque shapes of air guitarness in the kitchen. There aren’t many other albums with a stronger opening track, it’s a timeless piece of Rock and Roll and deserves its place up with the best opening tracks of any album (I am including Gimme Shelter here). But this listen-fest today is all about the cover. I spent the afternoon listening to the whole album, no skipsies, and while doing so I scanned every inch (or centimetre for you Europeans) of the vinyl cover. That cover shot of Simonon is something else, I doth my cap to you Ms. Pennie Smith, talk about capturing a moment. My favourite track from this album changes week by week, today it is Guns of Brixton, Roots rock meets Gangster Rap. Last week it was the cover version to end all cover versions, Brand new Cadillac, what a song. An aside; Travelling back to the UK in the late 1990s I was standing outside Gatwick Airport waiting for a hotel shuttle. A white van pulls up and a bleary-eyed Joe Strummer emerged with his raggle taggle possie. I was there by myself, nobody around, I had the chance to engage the great man in a debate on the burning political questions of the day, but instead I said how’s it going Joe? He was cordial and polite, but needed to catch a plane. I still regret that I missed my chance, 2 years later he was gone. I don’t know if ‘Guns Of Brixton’ is really gangsta rap. I mean, it’s pretty much straight up reggae played a little heavier. Jamaicans were playing this kind of hard edged political stuff long before London Punks or Harlem Rappers. I guess that is true – I mean, it is incredibly rousing even if you are a privileged white kid in the suburbs. There is just something righteously indignant about the lyrical content no matter who you are or where you come from. Love this album, know it by heart which may be the reason I haven’t listened to the whole thing in over a decade. Recently listening to CCR and noticed the song Walk On The Water from 1968 has some striking similarities to London Calling…seems Strummer was a closet CCR head.